Summaries and descriptions of past events. 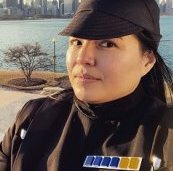 I am posting this here, because my weight loss has been a mission that, when I started, was primarily to fit into my Stormtrooper armor better. I posted a picture of what I thought was a healthier meal choice, and posted it on Facebook. My brother saw that picture, and offered me an incentive, saying "I will donate $5 per pound toward your weight loss, with the money going toward your Relay for Life walk". I had to go purchase a scale, and was shocked when I weighed in at 246.9 pounds. My dad wrote my brother, saying "If your brother loses 50 pounds, your gonna owe $250. ", and then my dad also offered $5.00 per pound, and my son, he offered $10 per pound. By the time the McLean County Relay happened in June, I was down 52 pounds! 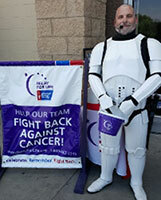 Several coworkers also made donations, and I raised over $1,000 for the 2018 Team Imperial Walkers, American Cancer Society's, McLean County Relay for Life efforts! That, and I feel a heck of a lot better. When I attended the formal in 2018 in my suit I got married in, I had lost about 10-12 pounds, I am currently at 70 pounds gone, and had to get a new suit for this years formal, because the other suit I wore last year is way to big on me!!!!!!! "Open the blast doors, Open the Blast doors!" Congratulations, trooper! That's quite an accomplishment! Your story needs to be told early and often! As always, awesome job! Great Work! I am so proud of you.